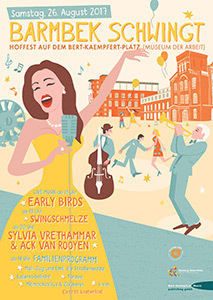 On 26 August the Museum der Arbeit and its neighbours in the square will be holding the 6th summer festival on Bert-Kaempfert-Platz. From 6 p.m. onwards the Early Birds from the BIG BAND PORT HAMBURG e.V. directed by Paul Muntean will be displaying their skills on the stage. Before this act starts the Bert Kaempfert Foundation will present its annual sponsorship prize to the Hamburg talent factory. The high point of the evening comes at 8 p.m., when the legendary jazz greats Sylvia Vrethammar and Ack van Rooyen take to the stage. Sylvia Vrethammar has been performing successfully across the globe for more than four decades. This year she will be presenting songs from her new samba album “The Girl From Uddevalla” and Bert Kaempfert. The distinguished jazz trumpeter and doyen of the flugelhorn Ack van Rooyen will be appearing as a special guest. This Dutchman has earned a firm place in the history of European jazz. The list of international artists and big bands he has played with is simply endless. The two will be accompanied by an all-star cast: Joel Lyssarides (piano), Bruno Müller (guitar), Christian von Kaphengst (bass) and Kai Schönburg (drums).